When photos of refugee Abdul Halim, 35, of Syria surfaced on the web a few days ago, it was truly a heart wrenching sight. 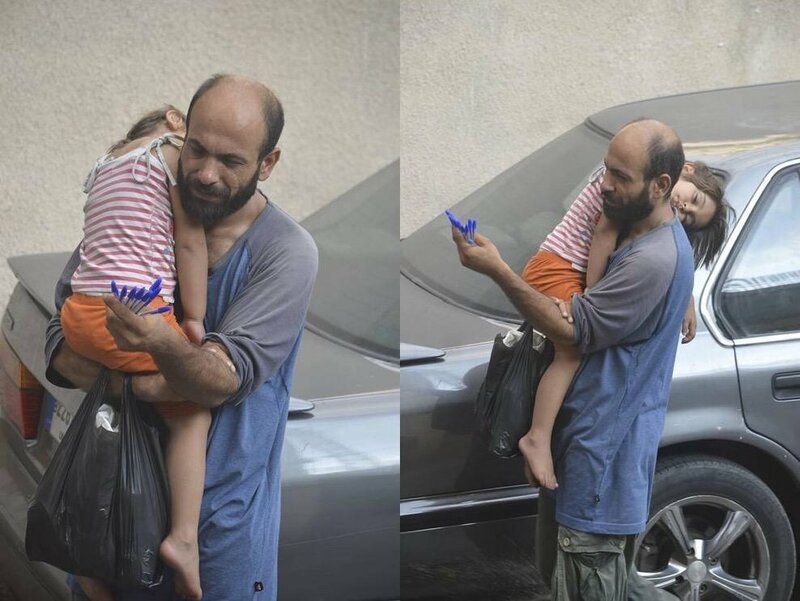 Selling pens while holding his sleeping daughter in the streets of Lebanon, the images have captured the hearts of many and a unprecedented wave of worldwide compassion and help has since developed. Posted on Twitter and going viral, the image was then retweeted by Norway-based Gissur Simonarson. Inundated with requests to help, he tried to identify Halim with Twitter users in Beirut playing a part with the hashtag #BuyPens. Promptly identified and tracked down with the assistance of activists, donations to a crowdfunding page soon reached $125,000 in the short span of 48 hours. Speaking for the first time in a televised interview, Halim planned to use the donations to ensure that his 4-year-daughter, Reem, and 9-year-old son, Abdalla, can go to school. “My goal for their future is to teach them. I don’t want them to stay with me on the streets, I don’t want my daughter to stay on the streets, and I want to teach my son. That is all that matters to me, us,” said Halim to NBC news from his apartment in Southern Beirut. Fleeing from the border of Syria approximately 3 years ago, Halim was just one of the thousands entering Lebanon to escape the clutches of the civil war back home, and like many others, has been unable to find employment. “This campaign will change my life positively. I want to help my siblings and help the Syrians here in Lebanon. I want to help my parents, my siblings that live in Syria,” Halim added.